Find artworks, auction results, sale prices and pictures of Rudolph Moller at auctions worldwide. 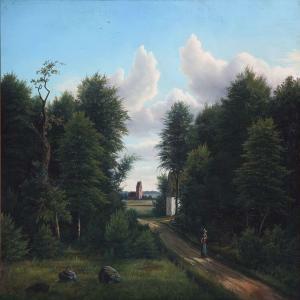 Forest path with a walking woman, in the background a Danish village church. Signed and dated Rudolph Møller 1865. Oil on canvas. 51 x 71 cm. In need of cleaning. Minimal peelings and crackles.